Podcasting has been around for quite some time, but it has experienced tremendous growth in the past few years. Today, there are more than 600,000 podcasts, and 28 million+ individual episodes available. Podcast listeners are affluent and educated, but, best of all, they're loyal. 80% of them listen to all or most of each individual episode, and on average, they listen to seven shows per week. When you consider the data, it comes as no surprise that many businesses, thought leaders, and marketers are considering starting a podcast. While podcasting can be a simple, inexpensive, and effective way of getting in front of your audience, it's not as simple as "if you build it, they will come." I've been using the medium for the last five years and, in that time, I have learned a thing or two about what it takes to build a successful podcast. I started my first podcast back in 2015 and got about 25 episodes in before I realized I wasn't going to be able to grow it, mostly because it didn't have a clear focus or format that was compelling to the audience I was trying to reach. A few years later, I took what I learned from that initial experience and used it to create The Inbound Success Podcast. Being much more focused, from day one, on what matters to my audience and helping them solve their most challenging professional problems. Staying committed to a consistent weekly publication schedule (in my case, a new episode goes live every Monday at 11:30 am ET - even when that Monday falls on a holiday like Christmas or New Years). Taking the time to book guests who can really add value, and doing it well in advance so that I have around six to eight episodes "in the can" at any given time. I've also learned a lot from my community of fellow podcasters, both here at IMPACT, and in the broader podcasting community. Recently, I reached out to them to ask what their advice is to anyone considering starting a podcast. What is one thing that a business, leader, or marketer who is thinking of starting a podcast should do? Be authentic -- stay true to who you are, your expertise and your personality. I promise that you will be more captivating to your audience if you are real and don't try to force yourself to fit into a particular box. Even if you talk about subjects or topics you're not 100% comfortable with, just say so! It's always better to be honest and raw, rather than fake. Find the podcast’s focus and start building around that. Think about what your audience actually cares about and talk about that - versus what you'd like to talk about, but your audience doesn't truly care. Ask them questions. Get to know what they enjoy listening to and make something they can't live without. Outsource the audio production to a professional. Do an internet search of the major keywords relating to your podcast PLUS the word "podcast" to see what's already out there. Document and have a good understanding of who your audience is, the goal of your podcast, the format, and a backlog of all the topics you'd like to cover and how it ties back to both the audience and goal. Make sure you also do research around others in the space who have podcasts covering the same topic as yours. You want to find a way to differentiate yourself. Also consider reaching out to people who would be in your audience and start getting a feel for what their challenges are and what would be interesting to them. Continue to do this as you're creating your episodes, don't just do it in the beginning. The ultimate thing to keep in mind is "How can I start a podcast that is going to bring education and value to my audience?" Think about if what you want to publish/share with the world is something you think should be a SERIES or not? Does it warrant a podcast (meaning something that will be steadily ongoing and not random)? Maybe it could be a mini-series / mini-podcast? (say, something with like 8 parts to it)? How are you going to be sure you've set aside enough time to consistently prepare, record, edit, publish and analyze your podcast between episodes? Can you really manage to publish say, weekly? Do you have a history of consistently publishing anything (blog posts, newsletters, internal reports/presentations) at that rate? Think about the recording and publishing infrastructure. Libsyn is critical to getting our podcast out there consistently and easily. I don't fully understand all of the production and publication pieces but I'm glad that someone at IMPACT figured it out and got it set up correctly otherwise we probably would never get off the ground. Consider who can help you and how. Podcasting can be a lonely thing and a lot of work if you don't enlist friends and allies to help you plan it, prepare for it, promote it and maybe even be featured in it as special guests. Definitely definitely think of this medium as a social one and consider how you will involve your favorite people from in and around your network to bring your podcast to life. Join a podcasting community because while barriers to entry of launching a podcast are low, building and sustaining a great show takes work. A community can provide feedback, support and inspiration. It takes a village. Have a clear mission for why you're creating the podcast, and a clear vision for where you're trying to go with it and who you're trying to reach. Focus less on all of the production stuff (fancy microphones, custom music, etc), and more on making the content valuable and engaging for listeners (ie. the talent). The worst thing you can do is spend a bunch of time recording, editing and producing a really put-together-sounding podcast that in the end offers nothing of real value to its listeners. Leaving aside the obvious "do your market research" tip (although please do that), be very specific about the problem you want to solve with your podcast. Then, write that problem down and share it with others. Determine if you're solving a real or imagined problem. After that, you should be able to say that every single episode you produce goes toward solving that problem. You should also use that written problem statement in your copy and scripting that explains what the podcast is about. Understand your audience and what's valuable to them. Simply defining what you want to talk about isn't enough. Take it a step further and figure out how what you have to offer is helpful to your audience and what they should gain by listening to your show. What is one thing that a business, leader, or marketer who is thinking of starting a podcast should NOT do? If you're thinking of starting a podcast, you should not settle for less than quality audio. If there's one thing that's worth investing in at the beginning, it's a quality microphone. Don't take it too seriously. We tend to get caught up in the science behind content and forget that podcasting (or our jobs in general) should be fun! You're going to make mistakes and not every single episode is going to be a smash hit, but that shouldn't stop you. If you hold yourself hostage to perfection, chances are you will never hit publish. Oh and trust me, your voice isn't as annoying as you think it is. It's simple - don't go in unprepared. Don't jump in without making important branding decisions. How long is the show going to be? What are the routines you'll stick to? What are things that you'll NEVER do? What kind of phrasing do you use and is is the way your listenership would say it? Do not think that a podcast is going to be as successful as YouTube or email newsletters. Remember: Podcasts reach a different audience. The person who listens to a podcast isn't the same person that reads a blog. Don't jump in without a plan. It can be easy to get excited about a topic and just start diving into content that you think will be valuable without gauging what your audience would actually be interested in. Do some research up front, start reaching out to people who would make up your audience and gauge what they are most interested in and what would be valuable to them. You also want to make sure that you plan out topics and guests ahead of time so you aren't scrambling each week. Don't start without a goal/objective in mind (or a "pivot strategy" if the goal is reached/not reached). What's your first milestone for this podcast? What's your second? What's your "tipping point" where if you're not at that point by a certain date/number of episodes, you pledge to pivot your strategy if not reconsider investing your marketing/publishing calories elsewhere. It's not popular to talk about giving up, but there's an opportunity cost to every decision you make and your podcast decision can come potentially with a large opportunity cost. Don’t simply record and pass the “tape” off to your editor. Listen back to your unedited shows regularly to critique yourself and improve. Work collaboratively with your editor on everything from better mic placement, your breathing, and show format. Don't start a podcast just because that's the next thing to do in digital marketing. 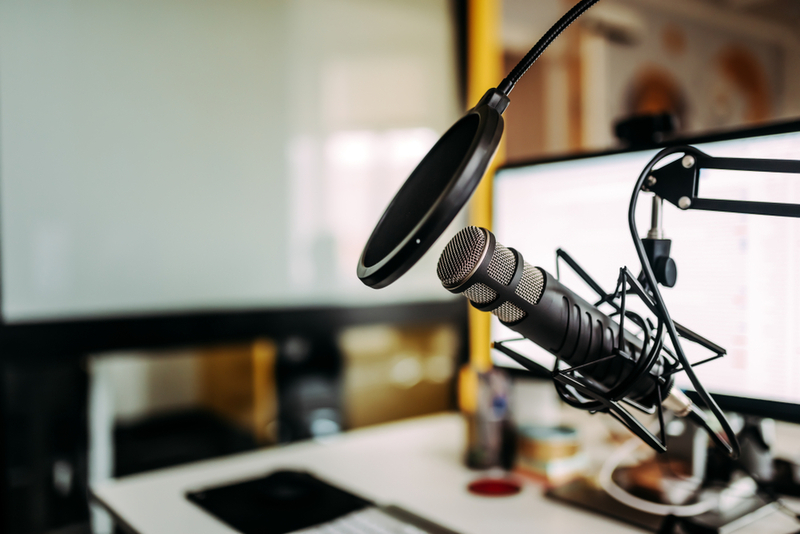 A podcast isn't just a different medium to publish your content on, it's a whole different type of marketing that requires a completely different strategy. Make sure you do your research on how to create an engaging podcast, and set realistic expectations for how much time you'll have to put into it and how much return you'll get out of it. Don't wing it. By "wing it," I DON'T mean experiment or be agile -- you should absolutely do those things. (My own podcast has evolved since I first started it last year.) What I mean, however, is you need more than a big idea and a podcast name. You need a format. You need to plan out your first 10 to 15 episodes. You need to loop other people in to, again, determine if what you're proposing is going to solve the problem you identified at the start. You need to have a plan for how you make time for your podcast (recording, production, promotion) in your weekly schedule and then block that time out in advance, otherwise your podcast will always get tossed around and deprioritized. You need an exit strategy. Etc., etc., etc. Don't jump in with no planning. Not that planning should consume months of your time, but going into a show with no idea how it will flow, how it will be interesting to an audience or how you plan to promote it is a recipe for a waste of your time. It sounds almost silly to say that when you start a podcast, you should treat it as you would any other marketing effort and begin with a strategy, but the reality is that too many podcasters just jump in without a plan and begin creating content with no goal in mind and no definition of success. As you consider starting a podcast, begin by defining your audience, understanding their pain points, and creating a podcast format that will serve your audience and address a need. Get good equipment and learn how to edit and produce a quality show. Most importantly, don't begin podcasting unless you're prepared to see it through. That means sticking to a consistent publication schedule and doing all of the surrounding work (booking guests, promoting the show, etc.) that needs to take place on a weekly basis. In my experience, its all worth it if you love what you're doing, you're passionate about your subject matter, and you personally derive value from creating your show. When you can check all of those boxes AND you have a solid plan of attack, you have a winner on your hands. "Alexa... Make a Real Human Read Me The News!"